A few retail employees at Apple Store locations have complained directly to Apple CEO Tim Cook, saying the company's policy of checking its employees' bags for security reasons was "embarrassing and demeaning." The new record comes from a court filing and is part of a 2013 lawsuit claiming the Cupertino company should compensate its employees for the time the bag checks take (via Reuters). One of the workers in the lawsuit sent an email to Cook back in 2012, claiming that Apple retail store managers "are required to treat 'valued' employees as criminals." In the filing it was said that Cook then forwarded the complaint to both top retail and human resources executives asking, "Is this true?" No responses to Cook's inquiry were documented within the filing made public this week. In the original lawsuit, which is seeking class action status after being dismissed last year, Amanda Friekin and Dean Pelle claimed that these bag checks were mandatory every time a sales rep left the store and were meant to discourage theft. In one of the original emails sent to Cook in 2012, the employee simply claims Apple's strict policy breeds an environment of distrust amongst its otherwise loyal workers. In the 2012 email to Cook, with a subject line "Fearless Feedback from Apple Retail Specialist," the employee said Apple's policy implies the company does not trust its workers. "These procedures are often performed in front of gawking customers," the employee wrote, adding that workers deserve to be treated with the same respect that Apple shows customers. As Reuters points out, in a Supreme Court ruling last December, Amazon won out over a group of its employees who sued the company for monetary compensation in the time they spent going through security checks at the end of their shifts. The Supreme Court's ruling erred on Amazon's side because it found these security checks were not a "principal activity" of the employees' job description. A hearing in the lawsuit is set for a July 2 date in court. Low wage high school kids working a near skill-less job, whining. Meh. Lots of small valuable items, its a logical and reasonable policy common in retail junk jobs. The main issue is that these checks take time and it isn't counted, so the employees suffer - there were other employees who said the time this took came out of their lunch break which to me is unacceptable. I appreciate this is the norm for high-value item stores, though they shouldn't be doing checks in front of customers and Apple should be treating their employees with a little more respect. 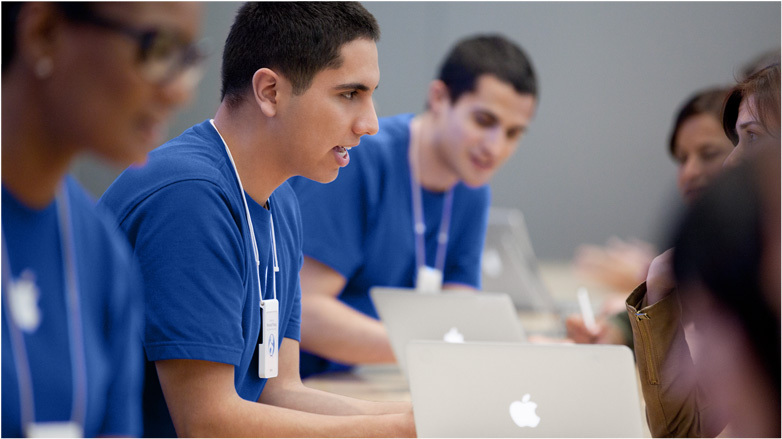 The Apple Stores do work hard, 7 days a week, and they're normally open 12-13 hours a day. Furthermore they do all the repairs in the evening so when they close up the doors it's not like they're twiddling their thumbs. I've had a call at 11:30PM to say that my MacBook was repaired (on the same day it was dropped off, may I add). I think you should treat people in the customer service industry with a little more respect; what people don't often appreciate is all the BS/angry consumers that they have to put up with as well, which just piles onto these existing issues. It's not appropriate to brush these issues under the carpet and just put it down to 'whining high school kids'; at the very least it deserves a thorough investigation. You should be compensated for anytime you spend doing something the company requested. You are responsible for getting yourself to work. Once you are there, if you need to count drawers, open up, setup, unpack, stow stuff away or anything else, it should be done on the clock and you should be paid you hourly wage for doing that. I hear all the time that people are expected to show up 10 minutes before their shift to count a drawer's cash and then when their shift starts on the hour is when they start getting paid. This employee to employer charity needs to be stopped. I think my position on the matter is likely to be controversial, however, i feel apple are perfectly justified to check employee bags. As others have mentioned, many companies do this, especially when such high value items are clustered in high density, juxtaposed with the huge number of employees a single store may employ. I do agree however, this should not hugely demean or inconvenience the employees. It has been a long time since I worked in retail, but I can assure you that even way back then (and not at an apple store) this was usual and customary practice. I thought the only questionable practice was that the employee had to clock out before the check and at time had to wait for a long time before they could leave. If they were to rule against Apple here I could see two implications -- first it would reach beyond apple to all retail companies that have similar practices and second I could see that they would not allow employees to bring in any bag or purse to work. Not sure that is the desired effect, but could easily be the outcome. By the sounds of it the people are suing for the time it took, not the fact it was happening... i would turn round and say "ok my great knowledgable people..." (who are not always that knowledgable -- I've seen people turn to other customers for answers instead...ive even had people come ask me instead...lol) "...we will pay you back for the time it took to search your bags - the whole 2mins each time - but all those extra bonuses, discounts, presents, gift cards we give you will stop... this will teach you for being so god darn ungrateful people...go work for Mcdonalds and then tell me if you feel more valued there than here." I don't mind it either, but I think two things should happen. 1. They should be compensated for it. They shouldn't have to do the search off the clock. Especially since it apparently takes a long time for the check to happen. 2. They should do it privately away from other employees and customers. So, let me get this straight. Any person off the street can just waltz in, grab something off the shelf and walk out under the premise they checked themselves out (and they are trusted to do so) but Apple is searching their own employees? Seems backwards to me. I assume they look suspicious when dancing into an out of the store. But maybe that's the way to go for those thiefs. When I was a deputy, I don't recall seeing a time clock outside of the jail. You stow your weapon in a locker, go through a scan, and enter. Then you clock in. Easy. Leave your bag at home. The court found that your belongings are not part of the job functioning and so they won't find sympathy that you're not getting paid for it to get sifted through. Let's explode this further. How about an apple employee bring a shopping cart full of their belongings to their next shift. Have it take an hour for it to all be gone through. Then let's count how many Apple employees think it would be fair for THAT person to receive compensation during that search. Sounds stupid right? So is your purse or man satchel. Leave it at home.